A sluggish office market is not slowing the expansion of one of southwestern Connecticut’s most prominent developers. During the past year, Stamford-based Building and Land Technology has redeveloped a harborfront complex that includes some 220,000 square feet of office space on Southfield Avenue in the city’s Waterside section. In a city with a roughly 30 percent office-vacancy rate, BLT also owns other large office hubs — some of which have empty space. But executives think their recent acquisition does not dilute their portfolio. 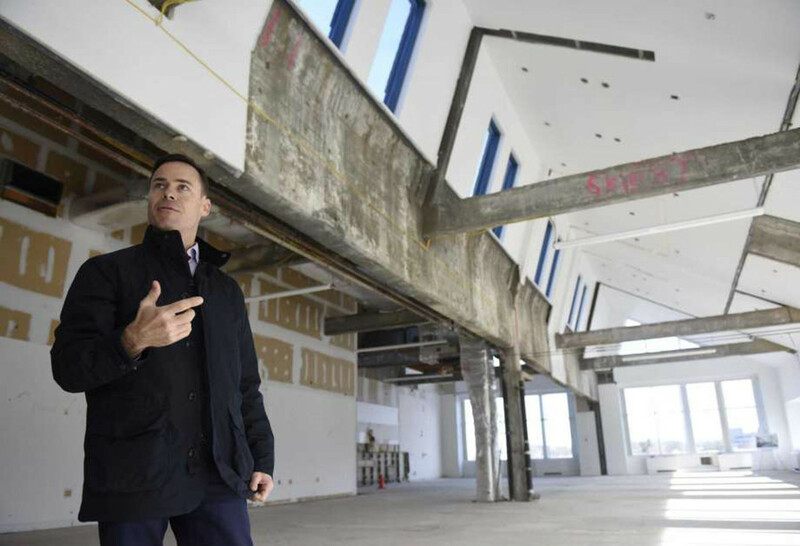 “I think what you don’t have is this really unique space — there’s very little waterfront office space,” BLT Chief Operating Officer Ted Ferrarone said last week during a tour of Harbor Landing’s offices. At the start of 2017, BLT acquired the five-building office campus for an undisclosed amount. The offices were formerly known as Stamford Landing. BLT already owned the adjacent site, where it is building 218 apartments and the Hinckley boatyard. Two restaurants, Prime and Crab Shell, stand on the property. Two of the office buildings, No. 1 and No. 2, were built as the Stollwerck Chocolate Factory around 1900 and later converted into offices. The other office buildings were built in the 1980s. Costing millions of dollars — BLT declined to give a specific total — the office improvements have transformed the structures. Stamford-based commercial real estate firm Rhys is the property’s office-leasing agent. BLT declined to comment on Harbor Landing’s office occupancy rate or provide a list of current tenants. Looking across the water to the South End, BLT officials can see from Harbor Landing their recent successes — and travails — in the office market. It has fully leased its office buildings at 2200 Atlantic St., and 100 Washington Blvd. Those properties form part of the mixed-use Harbor Point complex, which also includes more than 2,700 apartments. But BLT also owns the city’s second-largest office vacancy, the approximately 470,000-square-foot Silicon Harbor complex at 1 Elmcroft Road. Acquired in July 2015 for $38.5 million, the building is empty except for BLT’s offices. Standing next to Harbor Point, the property formerly housed Pitney Bowes’ headquarters, before the technology firm moved to a smaller base in the city at 3001 Summer St.
About a mile-and-a-half away in the downtown, BLT owns the nearly 600,000-square-foot complex at 200 Elm St.-695 E. Main St., whose tenants include Deloitte, Henkel and RSM. The latest recruit, Greenwich hedge fund Tudor Investment Corp., is scheduled to move in the spring to offices covering about 24,000 square feet. The complex, which is also known as the BLT Financial Centre, is now about half full. It stood totally vacant when BLT took it over in 2012, after the departure a couple of years earlier of reinsurer Gen Re to a new headquarters on Long Ridge Road. While it looks to fill its existing properties, BLT is also planning to substantially increase the city’s office inventory. At the Gateway Harbor Point complex at 406 Washington Blvd., it has proposed building a 500,000-square-foot tower to house a new headquarters for Charter Communications.